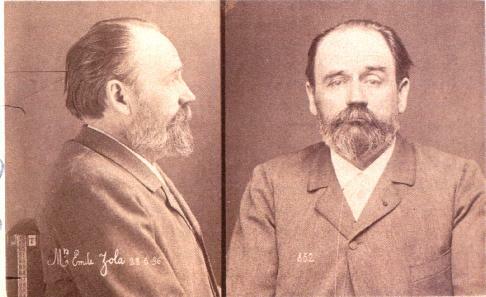 On this date in 1898 Émile Zola was brought to trial for libel for publishing J’Accuse…! an open letter to the president of France published on 13th January 1898 in the newspaper L’Aurore. In the letter, Zola accused the government of anti-Semitism and the unlawful jailing of Alfred Dreyfus, a French army General Staff officer who was sentenced to lifelong penal servitude for espionage. Zola pointed out judicial errors and lack of serious evidence. The letter was printed on the front page of the newspaper and caused a stir in France and abroad. 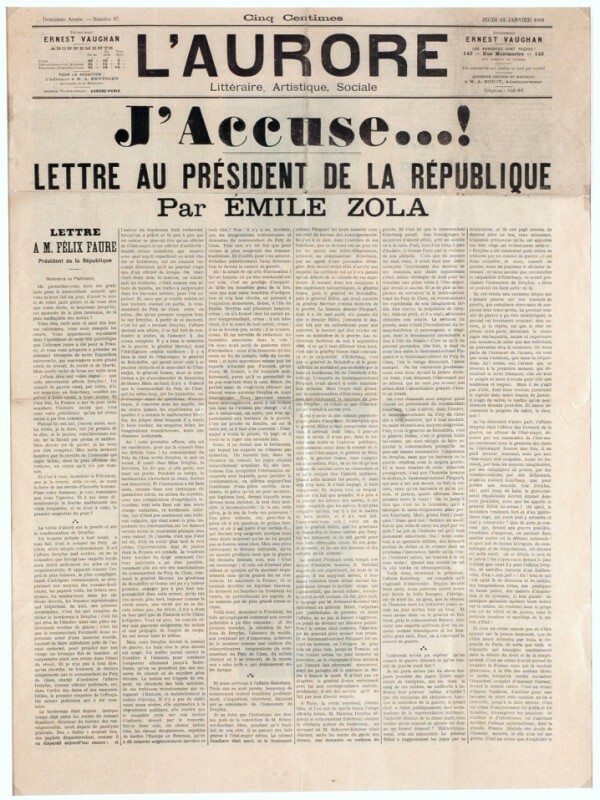 Zola published the letter with the intention of being prosecuted for libel so that the facts of the Dreyfus case would come to light. Let’s look at the details. Alfred Dreyfus was born in 1859 into a prosperous Jewish family in the city of Mulhouse, which was then located in the province of Alsace in northeast France. He left his native town for Paris in 1871 in response to the annexation of the province by Germany following the Franco-Prussian War. In 1894, while an artillery captain for the General Staff of France, Dreyfus was suspected of providing secret military information to the German government. A cleaning woman and French spy, Madame Bastian, working at the German Embassy was at the source of the investigation. She routinely searched wastebaskets and mailboxes at the German Embassy for suspicious documents. She found a suspicious bordereau (detailed listing of documents) at the German Embassy in 1894, and delivered it to Commandant Hubert-Joseph Henry, who worked for French military counterintelligence in the General Staff. The bordereau had been torn into six pieces, and had been found by Madame Bastian in the wastepaper basket of Maximilian von Schwartzkoppen, the German military attaché. 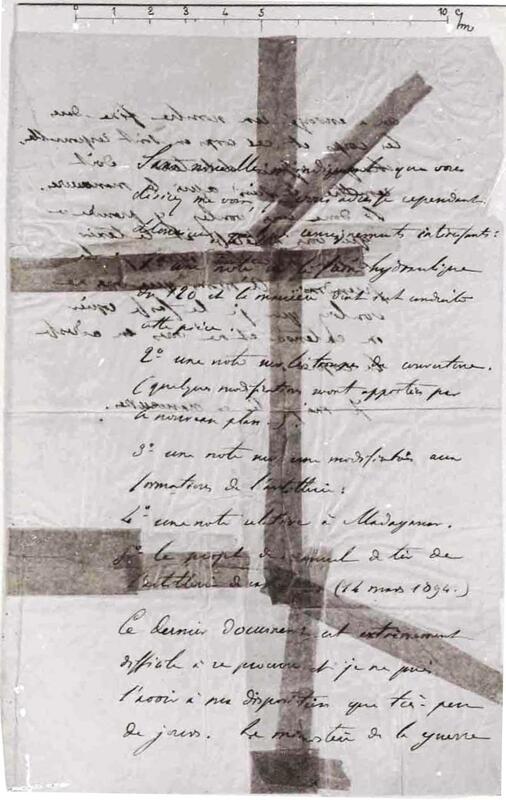 When the document was investigated, Dreyfus was accused of espionage and convicted at a secret court martial largely on the basis of testimony by professional handwriting experts: the graphologists’ assertion was that the lack of resemblance between Dreyfus’ writing and that of the bordereau was proof of a ‘self-forgery,’ and prepared a complexly detailed diagram to demonstrate that this was so. There were also assertions made by military officers who provided confidential evidence. In hindsight we now know that senior military officers used Dreyfus as a scapegoat for their own treasonous activities. Dreyfus was denied the right at trial to examine the evidence against him. 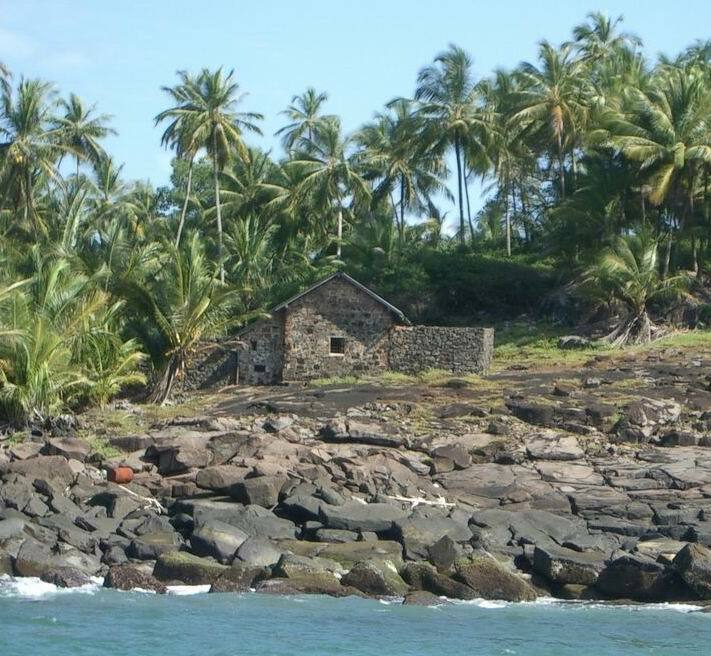 The Army stripped him of his rank in a humiliating ceremony and shipped him off to Devil’s Island, a notorious penal colony located off the coast of French Guiana in South America. Zola risked his career in January 1898 when he decided to stand up for Alfred Dreyfus. Zola’s open letter accused the French government of willful intent in falsely convicting Alfred Dreyfus, and also of anti-Semitism. His intention was to draw the accusation so broadly that he would essentially force men in the government to sue him for libel. Once the suit was filed, the Dreyfusards (supporters of Dreyfus) would have the opportunity to acquire and publicize the shaky evidence on which Dreyfus had been convicted. Zola argued that “the conviction of Alfred Dreyfus was based on false accusations of espionage and was a misrepresentation of justice.” He first points out that the real man behind all of this was major du Paty de Clam. 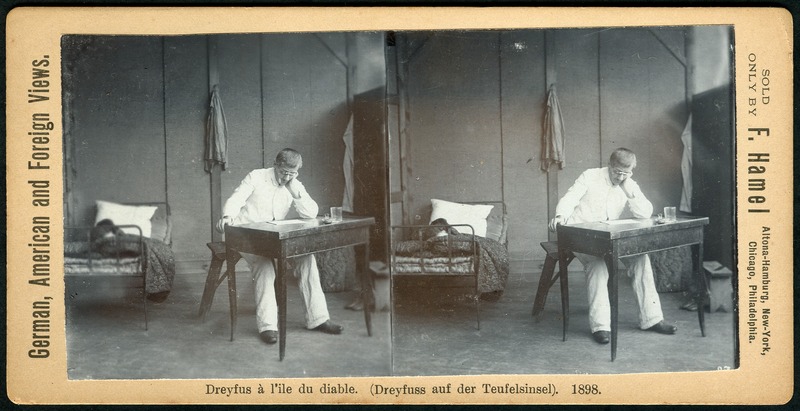 Zola states: “He was the one who came up with the scheme of dictating the text of the bordereau to Dreyfus; he was the one who had the idea of observing him in a mirror-lined room. And he was the one whom major Forzinetti caught carrying a shuttered lantern that he planned to throw open on the accused man while he slept, hoping that, jolted awake by the sudden flash of light, Dreyfus would blurt out his guilt.” Next, Zola points out that if the investigation of the traitor was to be done properly, the evidence would clearly show that the bordereau came from an infantry officer, not an artillery officer such as Dreyfus. Zola was brought to trial for libel for publishing his letter to the president, and was convicted two weeks later. He was sentenced to jail and was removed from the Légion d’honneur. To avoid jail time, Zola fled to England, and stayed there until the French Government collapsed; he continued to defend Dreyfus. Four years after this famous letter to the president, Zola died from carbon monoxide poisoning caused by a blocked chimney. 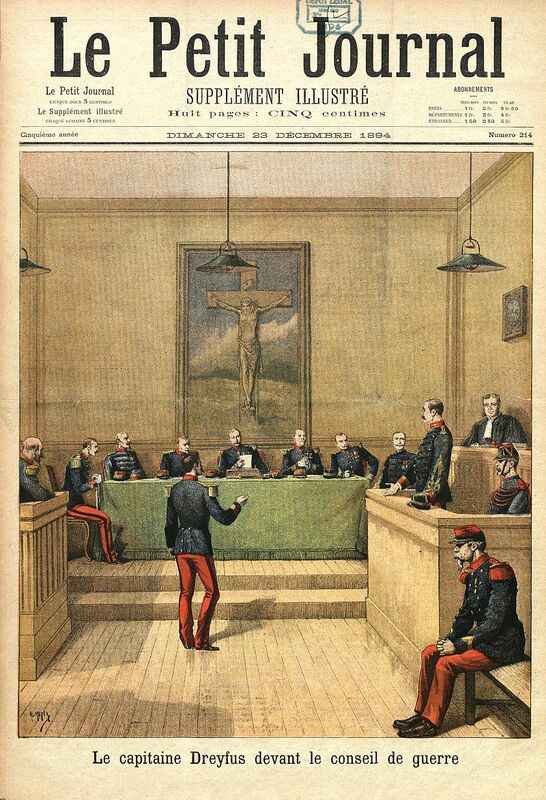 In 1899, Dreyfus returned to France for a retrial, but although found guilty again, he was pardoned. In 1906, Dreyfus appealed his case again, to obtain the annulment of his guilty verdict. In 1906, he was also awarded the Cross of the Légion d’honneur, which stated, “a soldier who has endured an unparalleled martyrdom.” Rehabilitated, Dreyfus was reinstated in the army with the rank of major and participated in the First World War. He died in 1935 with the rank of lieutenant colonel. I have written several times here about a general misunderstanding, especially in the US, concerning so-called “Jewish cooking.” In the US there are recipes such as matzoh ball soup, gefilte fish, kugel, knishes, babka, blintzes, challah, rugelach, and on and on, that are associated with “Jewish cooking,” but if you know anything about European traditional cooking, you will know that these dishes are common in certain regions, and the only reason that they are associated with Jewish cuisine in the US is that they were brought to the US by Ashkenazi Jewish immigrants, particularly from Russia, Poland, and Germany. Jews in France did contribute significantly to the ingredient list for French cuisine. By all accounts they introduced foie gras as a means of obtaining high quality fat other than lard. They supposedly introduced truffles, and also chocolate from the New World via Jewish merchants in Spain. I don’t know how true any of this is, but it gives me an idea. I will not ever give a recipe for foie gras because I see its production as utterly barbaric, and I almost never cook with truffles because of the expense. But when you add chocolate to the list, and think of the word “truffle” you are off to the races. 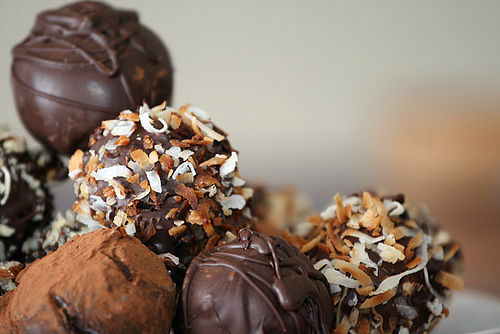 Chocolate truffles get their name because they resemble fungal truffles. There are numerous ways to make truffles. The French method is certainly the simplest. They are no more than a ganache center coated with cocoa powder or crushed nuts, or powdered sugar. Put the chopped chocolate into a large ceramic bowl. Heat the cream almost to the boiling point and pour it directly over the chocolate. Stir until the chocolate is melted and combined with the cream. Then add the butter and continue stirring until all the ingredients are thoroughly blended. Cool and refrigerate. Stir every 15 minutes until the ganache has set, so that it is firm enough to scoop. Using a melon baller or small spoon, scoop the ganache into 1 inch lumps and roll into balls, handling quickly. Roll the balls in cocoa powder, place on parchment paper on a tray and refrigerate. Eat within 2 days.